Eagles linebacker Connor Barwin joined the newest edition of "The Buzz" podcast to discuss football, his "hipster" reputation and more. 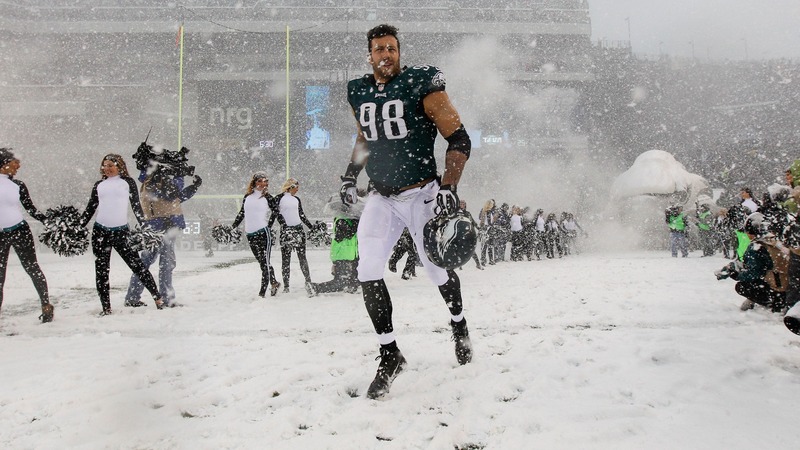 Barwin revealed the tricks players use when they have to play in the snow, talked about what it’s like to play for Chip Kelly, gave very strong opinions on a cold-weather Super Bowl and Thursday night games, reminisced about the time he was fined for wearing socks that were too high and named a few of his top albums of 2013. You can download the podcast on iTunes or listen to it below. The Auburn radio call of Chris Davis’ game-winning touchdown against Alabama in the Iron Bowl is the gift that keeps on giving. Today we have a Tigers fan who set their Christmas lights to that audio clip. Someone paid $104,000 for the shoes Michael Jordan wore during his "Flu Game." Ohio State center Amir Williams almost didn’t catch himself in time during this postgame interview last night. Roy Hibbert celebrated his 27th birthday at a Justin Timberlake concert last night, where he was serenaded by the pop star and crowd. Close your eyes when you play this video of 16-year-old David Thibault and you will think Elvis is alive. You may not be singing the right words to some of the top songs of 2013. * Logan Morrison, who was dealt from the Marlins to the Mariners on Wednesday, wrote a first-person account of the emotions an athlete goes through when he’s about to be traded. * George W. Bush sent a nice letter to Alabama kicker Cade Foster after the Iron Bowl. * U.S. women’s soccer players are fighting on Twitter. Model Nerea Acre gets today’s Fox-y Lady honors.